The horse is a strange paradox of strength and acquiescence — and this presents profound challenges for those with responsibility for their welfare. Paramount in this obligation are owners, breeders, trainers and veterinarians. Our team combines expert veterinary knowledge with the passion of lifelong horse owners. Read what some of our customers have to say about us here. 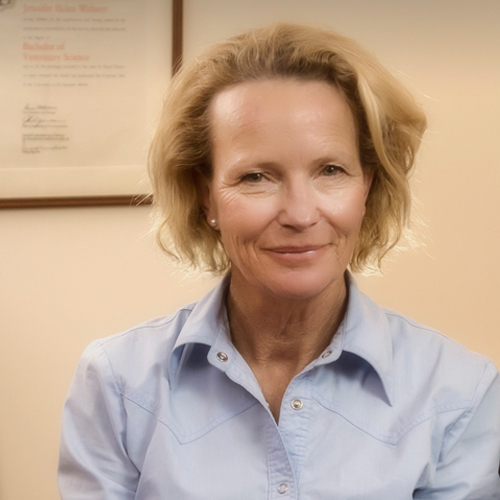 Dr Jennifer Stewart is an equine veterinarian with over thirty five years’ experience. She is also a consultant nutritionist and has formulated feeds, custom mixes and supplements for leading international horse feed manufacturers in Australia, India, Ireland, Japan, New Zealand, Philippines, South Africa, Thailand, Turkey and the UAE. Dr Stewart is passionate about equine nutrition and its role in the management, treatment and prevention of many equine diseases. She is committed to bringing ‘science to the feed bin’. Dr Stewart graduated BSc(vet) and BVSc at the University of Sydney. Her research thesis was "Resistance of Equine Strongyles to Benzimidazole Anthelmintics" and her PhD "Studies on Heart and Lung Function in Foals". She worked at the Universities of North Carolina, Michigan and Florida USA in equine medicine, antibiotics and exercise physiology. Following this was a time spent in Newmarket and Cambridge England, in stud and race track research and practice, before establishing an exclusively equine practice on the Central Coast of NSW Australia. She has been an official veterinarian for the Australian Jockey Club for over 20 years, was one of the team of equine veterinarians for the Sydney 2000 Olympic Games and consultant nutritionist for Mitavite for 10 years. Dr Stewart has spent over twenty five years working on collaborative research projects into gastrointestinal and exercise physiology with major Universities; lecturing and supervising university and TAFE students; consulting to veterinary practices, trainers, pony clubs, owners, equestrian centres and studs; speaking at seminars in Australia, Middle East, South Africa, Philippines, SE Asia, Hong Kong, Japan, Turkey, India and New Zealand, and writing regularly for equine industry magazines. This experience in research, equine medicine and veterinary practice has given Dr Stewart a deep understanding of the complexities of equine health and performance; growth and development of young horses, and feeding practices for the management and prevention of diseases. Trudi Bird has over thirty years experience as a small business owner, manager and entrepreneur. She has extensive knowledge of the horse feed manufacturing industry having held a key position at Mitavite for five years, specialising in logistics, distribution and export. Trudi has been working alongside Dr Stewart for over ten years and has played a key role in the development of Calsorb Forte and Bone Formula Forte as well as managing Stewart Veterinary Services and helping establish Jenquine. Personally Trudi is actively involved in environmental protection through her wilderness property in Tasmania, co-managed by her husband Scott. She comes from a farming background and has a strong connection with the land. Trudi is also passionate about music and the arts, humanitarian work and animal welfare. The whole team at Jenquine share common core values and a passion for equine health. They are committed to helping horses and their owners. Kristie Morris was smitten by horses early but didn’t start riding until 12 yrs old. She bought her first horse when 15. As a young adult she started a long, enjoyable and productive relationship with the Walker family of Marena Stud. This has given Kristie both great pleasure and an increased knowledge of all aspects of a working stud, riding academy and high level competition. From first conception right through to raising, training, schooling, competition, retirement, stud duties and aged care, Kristie has followed many individual horses through this journey with Maureen, Bruce and Lindy Walker. She currently owns two Marena bred horses and continues to work and learn from the Walkers, now into her 16th year. In 2004 Kristie completed a certificate 4 in equine nursing and is currently studying a bachelor of agriculture, majoring in animal production through the University of New England, NSW. Dr Stewart asked Kristie to join the Jenquine team in 2013. As a horse owner Kristie is able to relate to the troubles and stresses that come when striving to keep our horses’ health and welfare balanced. Kristie enjoys being able to help fellow horse owners create happy, healthier horses. Amy Luxford is leading a life rich with horses. Born into a family heavily associated with horses across a vast array of disciplines and working lifestyles, it is firmly ‘in the blood.’ Beginning her riding career like most, attending a local Pony Club with ex-racehorses during her childhood growing up in Victoria, Amy transitioned down a different path upon moving to Central Queensland in 2013, discovering a deep and new love for fast spins, big stops and snappy cowhorses. Along with her Station-bred Quarter Horse mare and Jack Russell Terrier, Amy has recently made some new career and residential leaps, from the Springsure region as a station hand, to settle in the North Burnett Region at Gayndah, in order to pursue her passion in the animal and equine health industry. Prior to her time spent as a station hand, Amy had a leading role in a large feed and rural supplies store in Moranbah, Queensland, and was given many great learning opportunities to extend her knowledge across equine and domestic animal health products, offering clients and their beloved horses and pets the best possible nutrition available on the market. Very quickly Amy identified a lack of current, up-to-date clinical understanding of NSH (“Bighead is a dirty word!”) amongst clientele, friends and family. Having seen first-hand countless hard-working station horses retire prematurely from their jobs, and performance horses suffer silently through the insidious symptoms of NSH, it is Amy’s goal to change how the disease is perceived amongst horse owners and professionals, so that all equines living on oxalate pasture can receive the nutrition, care and treatment they deserve.